First appearing in Star Wars Episode IV: A New Hope, the Tusken Raiders are a fierce nomadic warrior race, and as briefly as they might appear in A New Hope, Episode I, and Episode II, Funko has done an amazing job bringing them to life with the Star Wars Tusken Raider Pop! Vinyl Bobble Head! Inspired by the urban, stylized look of modern vinyl figures, these Tusken Raider bobble heads stand 3 3/4-inches stall, and make a great gift for children and adult collectors alike. When you see just how cool the Tusken Raider looks you'll want to collect the rest in this line of Funko Star Wars vinyl bobble heads. 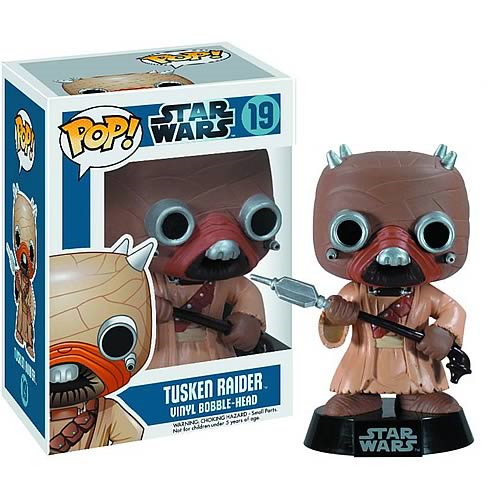 The Star Wars Tusken Raider Pop! Vinyl Bobble Head comes in a displayable window box, so it'll look great sitting next to the rest of your Star Wars collection! Ages 5 and up.